The Technique that Makes You Stronger in Seconds! 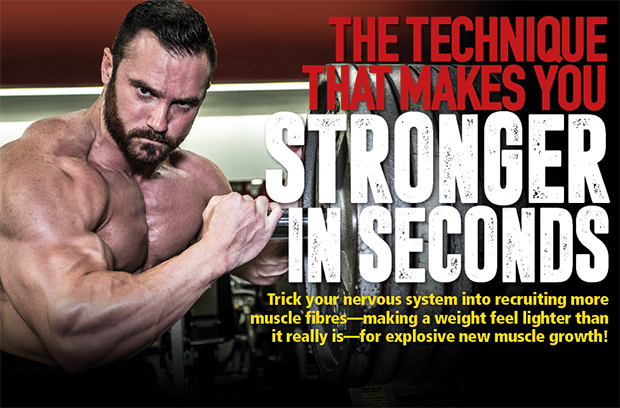 Trick your nervous system into recruiting more muscle fibres—making a weight feel lighter than it really is—for explosive new muscle growth! With the extra motivation, I added one, and then a second plate to each side, above and beyond what I normally could do. So far, so good. Then I added a third. And that felt as if I was pushing against Fort Knox. Quickly racking the weight, I assessed the ego damage and took a single plate off of each side—but I was still in unchartered territory for this heavy load. Thinking I was in for a battle, I unlocked the sled and found something remarkable: The super-heavy load wasn’t nearly as bad as I had thought it would be. I discovered, quite by accident, a training concept called post-activation potentiation (PAP), a concept in which you can literally increase your strength in just minutes! Potentiation refers to the ability of doing one exercise to enhance the performance of a secondmove that immediately follows it, says exercise physiologist and celebrity trainer Jimmy Peña, MS, CSCS, author of Prayfit, and a regularly appearing strength and conditioning specialist on NBC’s Extra and VH1’s Celebrity Rehab with Dr. Drew. Peña notes that if the idea seems far-fetched, consider the on-deck baseball batter practicing his swings with the aid of a weighted doughnut. A few cuts with the extra weight make the bat feel lighter, giving the hitter more power when he’s at the plate. The extra weight has increased the stimulation of his nervous system, calling into action more muscle fibres than it normally would recruit. In reality, it’s a trick that you’re playing on your nervous system. While I discovered it quite accidentally, it can be intentionally done with the same effect. Let’s say you loaded up the bench press with 275 pounds for a couple of reps. By backing off the load, say 20 to 30 pounds on your next set, that new load will actually feel lighter than it normally would. So you’re able to crank out an extra rep or two beyond what you normally do. By employing it strategically in your training, you can pack on size starting with your very next workout. Peña recommends incorporating the principle of potentiation into your workout by choosing a single exercise for each body part. “You’ll use multi-joint movements and choose a weight (after you’ve warmed up) that’s short of your max lift for that exercise and do just 1 or 2 reps (using good form), but don’t go to muscle failure—with a spotter if necessary. After that set, take a lengthy rest period of up to three minutes to ensure full recovery, then reduce the resistance by about 10 percent. The weight should now feel much lighter. In mere minutes, you’ll be recruiting more muscle fibres and be able to complete another 1 or 2 reps on your own—roughly a 10 percent increase in strength. You can repeat multiple sets in this manner. I’ve found that I didn’t need to repeat the heavy weight again, but some practitioners advise alternating the very heavy and working sets to continue priming the pump. Limit the technique, which is sometimes referred to as the max-out method, to 3 sets of one exercise per body part, usually on the first movement in your workout. But you have to be very well warmed up for this to work without causing injury. Ultimately, maxing out isn’t really about training with your maximum weights but tricking your body into recruiting more muscle fibres than it really needs to get the job done. Get a spotter. Whenever you handle very heavy loads, it’s a good idea to have a spotter on hand for safety. Some exercises work better than others. Stick with multi-joint exercises for larger muscle groups, and barbells and machines are typically better choices than dumbbells because they’re easier to spot when training heavy. Here are some general guidelines for working weights. If you know your one-rep max (1RM), use 90 percent of it as your heavy weight and then back off to 80 percent on your working sets. Never take those heavy sets to muscle failure because that induces greater fatigue, which affects your ability to complete following sets. While some moves, especially compound moves such as the squat and bench press,are often done with a weight that approaches your max, for other moves such as barbell curls, you can choose a weight that corresponds with a slightly higher rep target—but still do just 1 or 2 reps. With many single-joint moves such as this, you don’t have to use a resistance that approaches your max; instead, choose a weight that’s noticeably heavier than you’d normally do. By the way, the teenage kid who I felt challenged by on the leg press at the gym turned out to be eventual 212 lb. IFBB pro bodybuilder Stan McQuay. We actually used him for a few photo shoots later when I was with Muscle & Fitnessand MuscleMag, so I guess he wasn’t just any run-of-the-mill punk!